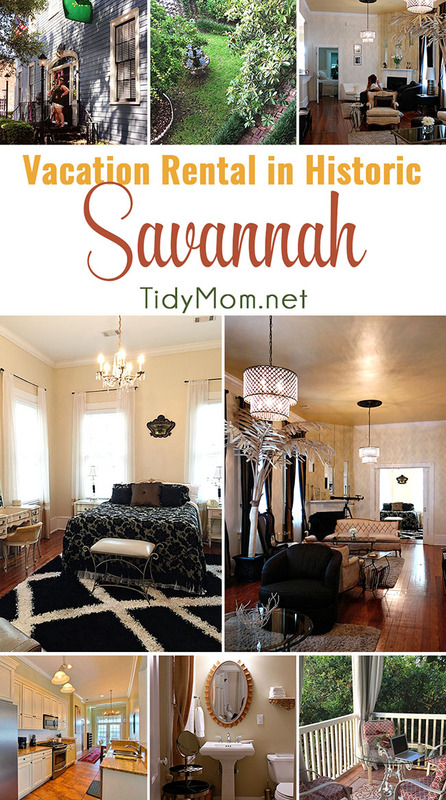 Nothing epitomizes Southern grace and charm quite like Savannah, GA. Last week I shared our vacation rental and great places to eat in Savannah. 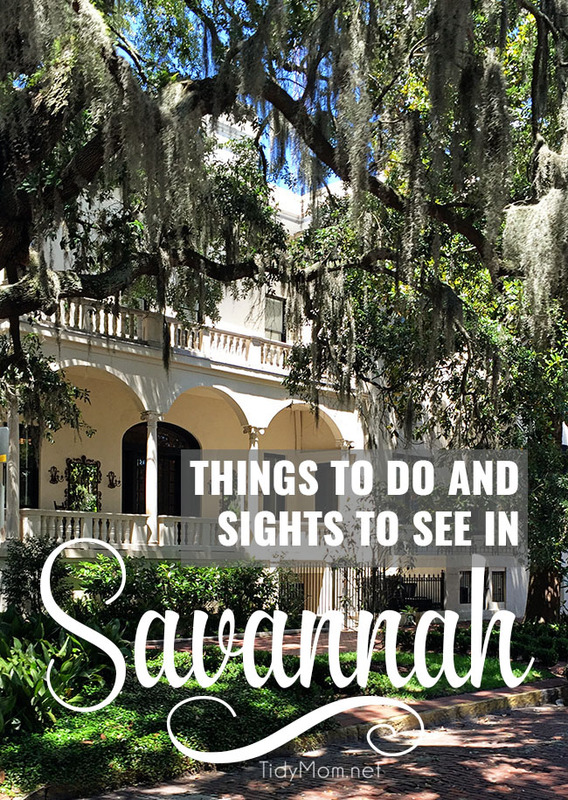 Today I’m sharing some of the THINGS TO DO AND SIGHTS TO SEE IN SAVANNAH. 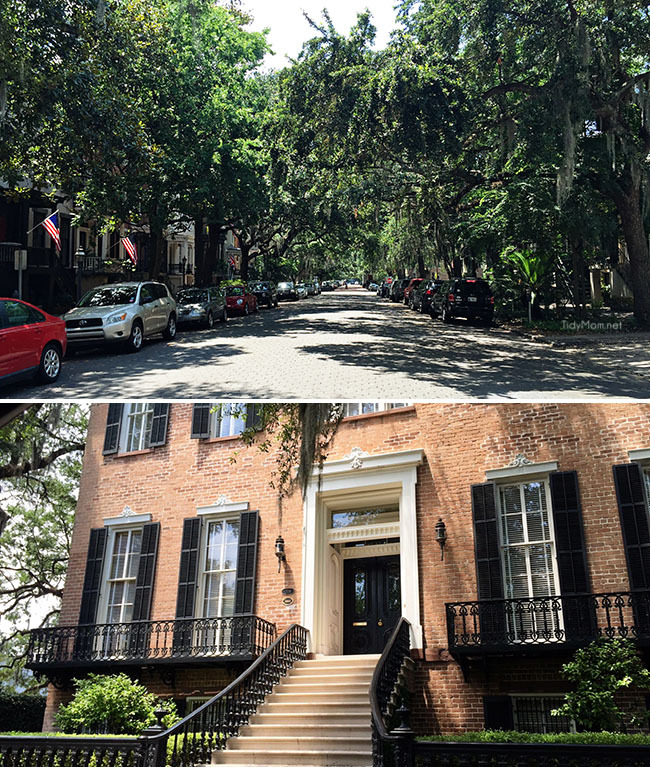 The historic district has 22 squares, countless beautiful, grand homes, the most beautiful street in America – Jones St., Broughton Street for shopping, River Street for many pubs and shops, and just so, so much to see and take in! Walking around Savannah is sure to be one of the most beautiful walks you’ll ever take. 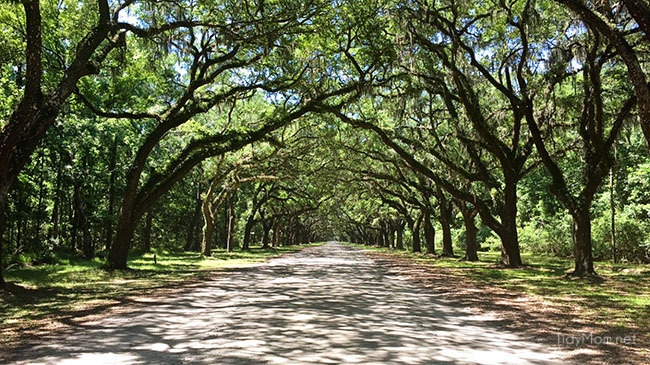 Many of the streets are lined with hundred-year-old oaks dripping with Spanish moss….it’s breathtaking. 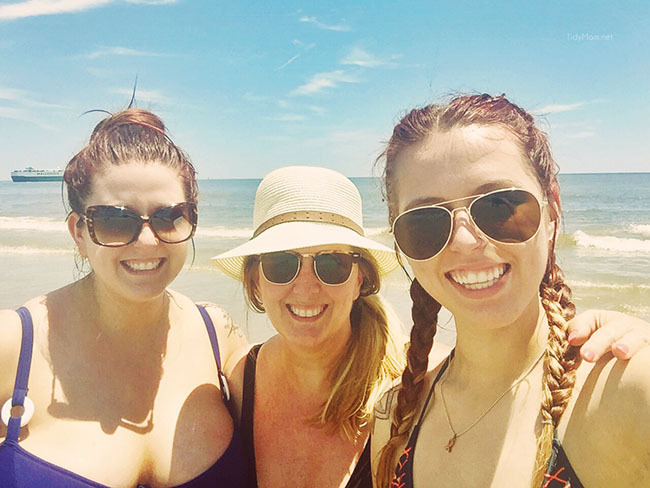 My daughters and I recently went non-stop in Savannah Georgia, for our annual girls trip. As one of the South’s oldest cities, Savannah has no shortage of history. Be sure to bring your walking shoes and your cameras, because the city is sprawling with beautiful historic homes and beauty. 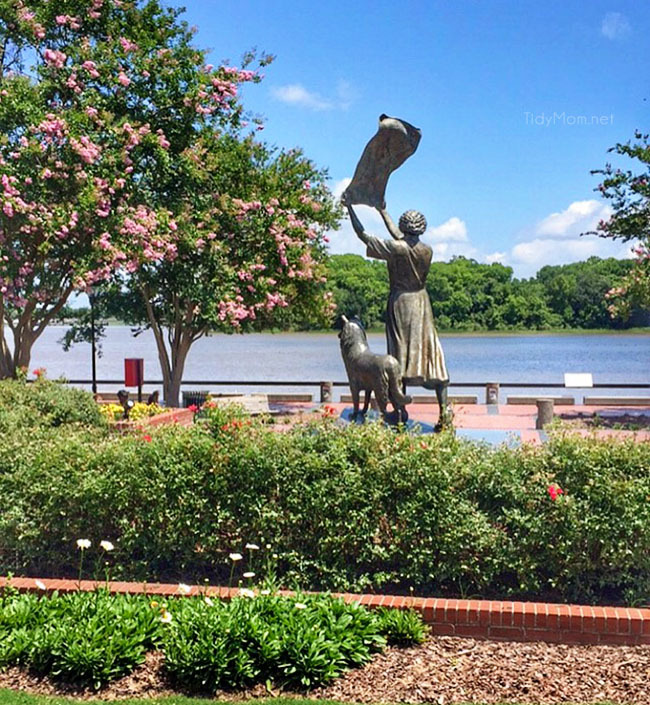 While this fascinating city, with small-town charm, is completely walkable, we did rent a car so we could visit a few places just outside Savannah as well. Tip: if you have a Costco membership, they have great deals on rental cars, including unlimited mileage. After a lot of contemplation we decided to pay for trolley tour tickets. With all the vacations we’ve been on, we have never done one of these due to worries they wouldn’t be worth the money. 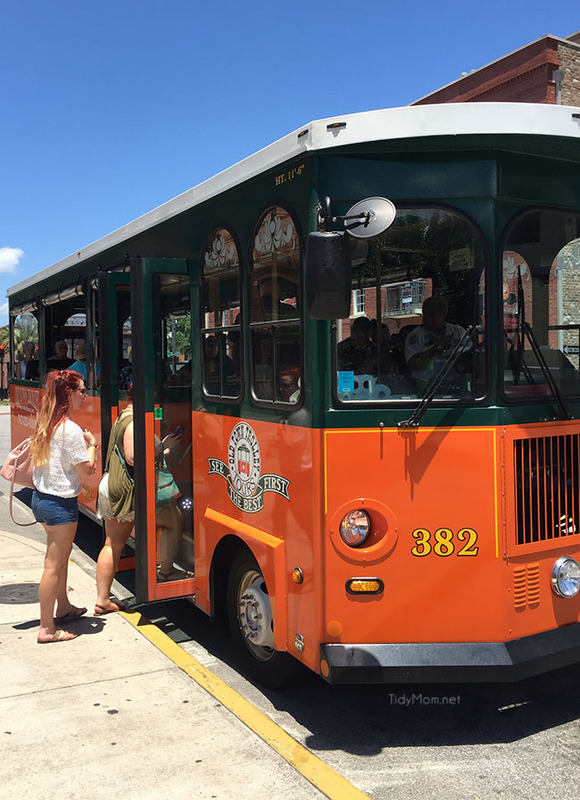 Now, I can’t speak for trolley tours in other cities, but the Old Town Trolley Tours in Savannah will not waste your money. It’s a hop on. hop off tour and they have an app on their website that allows you to track exactly what time a trolley will be arriving in each spot. That was great because each time we got off we didn’t spend time waiting for the next trolley (they come every 20 minutes, and with the app you will know the exact minute the trolley will arrive at your spot). There were 15 different stops that took you all around historic Savannah. This was a great way for us to get to know the area better, and to figure out places we wanted to visit another day. Also the history you learn from the tour guide makes the experience better. Instead of just looking and taking pictures of cool buildings, you actually get to know what really makes them historic. 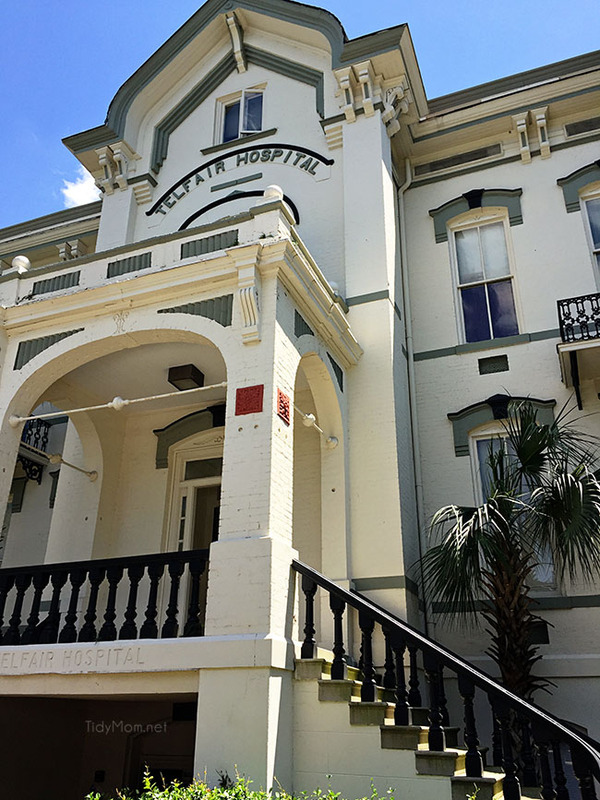 Old Telfair Hospital in Savannah, GA was a women’s only hospital – no men allowed unless they were born there, then they had to be out within 3 days after birth. It is now the “Telfair Arms Apartments”, a senior-living residence. 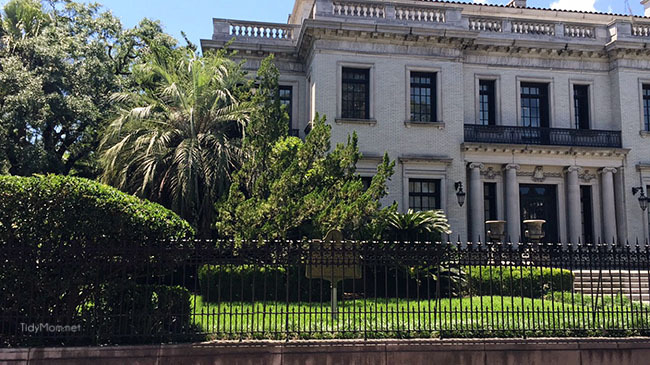 Locals will tell you that this former ladies’ hospital is haunted by Mary Telfair, who has been known to appear in the hallways wearing a brown dress. Definitely, take a stroll along this quaint tree lined cobble stone street. The Spanish moss-lined, JONES STREET, SAVANNAH, GA holds the bragging rights to the title of the most beautiful street in America, according to Southern Living Magazine. 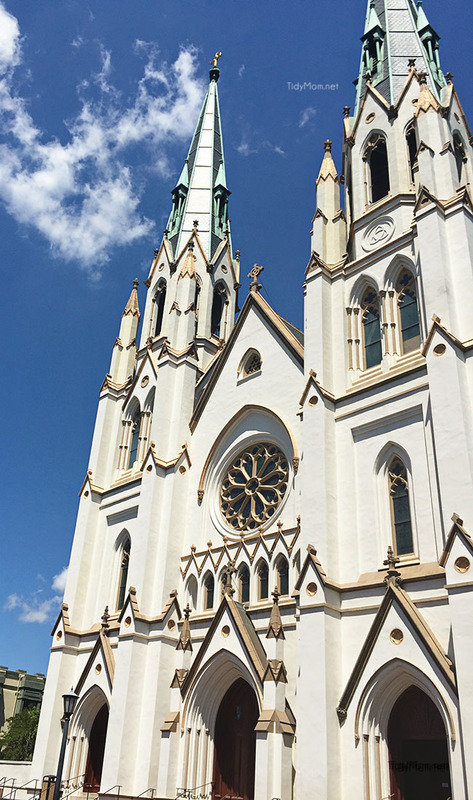 Cathedral of St. John the Baptist Savannah, GA.
There’s no shortage of awe-inspiring places of worship in Savannah and none are quite as magnificent as Lafayette Square’s Cathedral of St. John the Baptist, which has two magnificent bell towers that ring out on the hour. 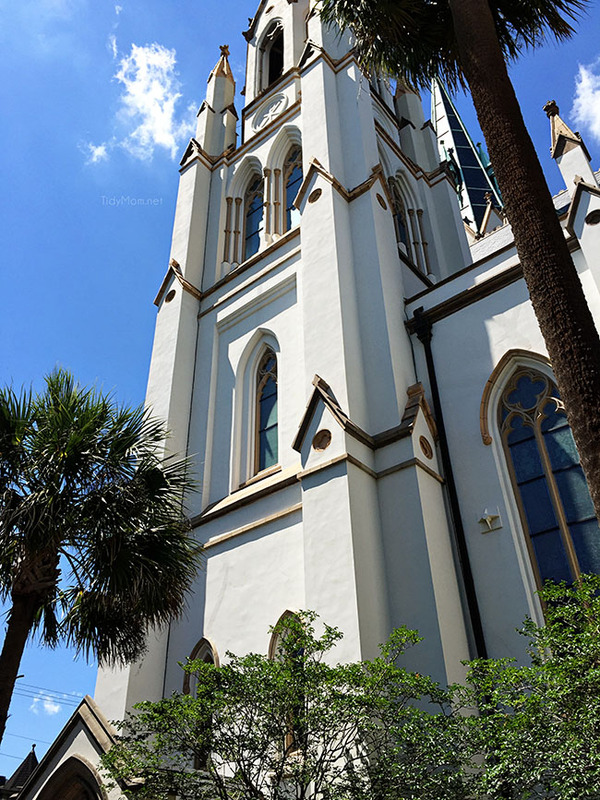 If you only have a short time in Savannah make sure that you make your way over to this French Gothic cathedral and go inside. The interior of the Cathedral of St. John the Baptist is one of the most impressive interiors of any building in Savannah. 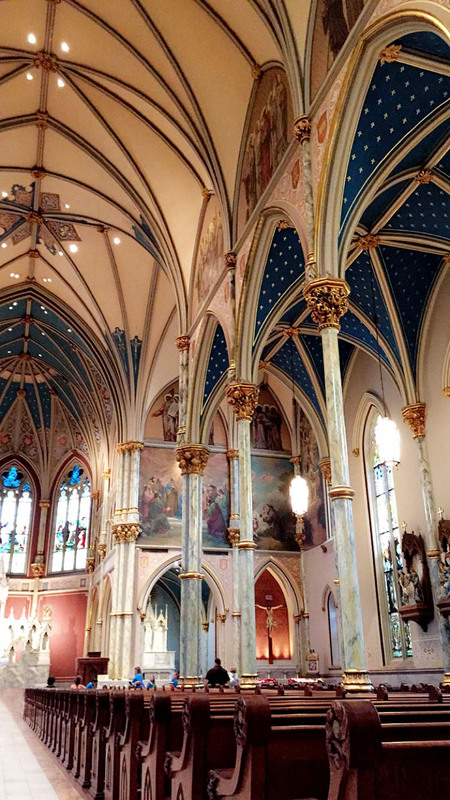 The vaulted ceilings, the altar, the windows…..all must be seen in person to appreciate. First African Baptist Church, 23 Montgomery St., is a house of worship that we passed on the trolley tour, but never made it back to see more. With a congregation dating back to 1773 and building dating back to 1859, this church has a history of being a stop on the underground railroad. It’s supposed to be wonderful to visit and offers two tours a day. Of course, if you’re a Forest Gump fan, you’ll want to see the Independent Presbyterian Church, 207 Bull Street, which was featured in the opening credits of the movie. While Savannah is rich in history, its also rich in ghost stories and hauntings. My daughters are big fans of super-naturals and the like, and we’ve been on a few ghost tours in other cities, as well as a little ghost hunting at home in St. Louis at the Lemp Mansion, we found the walking ghost tour we took in Savannah a big waste of our money and time. I’m guessing there may be some ghost tours that are better than others, and while we thought we did some research online (meaning we checked trip advisor), if you are interested in that sort of thing, I suggest getting some first hand recommendations before you spend $25/person. 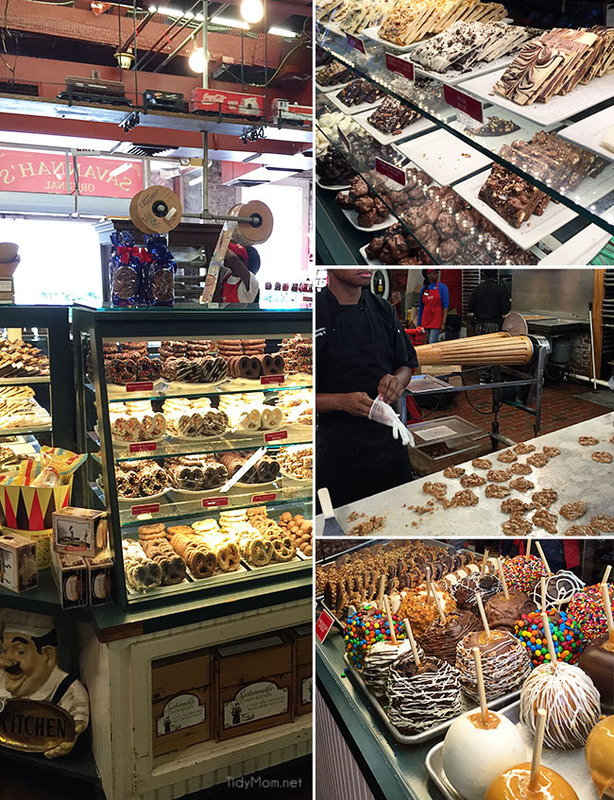 The Savannah Candy Company was a store full of what childhood dreams are made of…. chocolate, and candy galore! This place is worth the stop, and most definitely worth the calories. To make it even better, they offer free samples! As soon as we walked in we were offered samples of their famous pralines. They were even still warm when we got them. My mouth is watering just thinking about them. There are two locations; City Market and River Street. Be sure to stop by one of them to pick up some pralines! They are a must! The Savannah Bee Company is a store that offers unique in store experiences making it a cute place to check out while in Savannah. They are similar to Burt’s Bee’s in the respect that they have natural beauty products, but there are two things that make this company different. They sell lots of different honey, all of which you can sample (Yay for more free samples!) The honey all tastes different based on the type of flowers the bees went to. Our Favorites were the Acacia Honey, and the more traditional honey, Honey for Your Tea. Now here’s where things get interesting. They also have Mead tastings. If you’re like my daughters and me, I’m sure you’re thinking what in the world is Mead, and why do i want to taste it? Well if you’re 21 and over you will probably want to do this tasting. Meed is an alcohol made from fermented honey. Sounds so weird, right?! They have 5 different types of Mead to try, ranging from a beer, to a champaign, or wine like taste. For only $7 you actually go a lot to try. Heather and I both enjoyed it so much we bought two bottles. Heather bought the bottle featured in the picture above. The Monks Mead was the more beer like one. I bought The Star Thistle, which had the taste of a semi sweet white wine. Overall the tasting was a good time. Plus our bartender was pretty funny which always makes things more fun. With all of the Georgia heat we couldn’t go 5 days without making time to kick off our shoes, put our toes in the sand and cool off at the beach. So we loaded up the rental car with our floaties, sunscreen, and a good reading material, and we were off to Tybee Island. It was an easy 25 minute drive (18 miles) from our house in the Savannah Historic District. 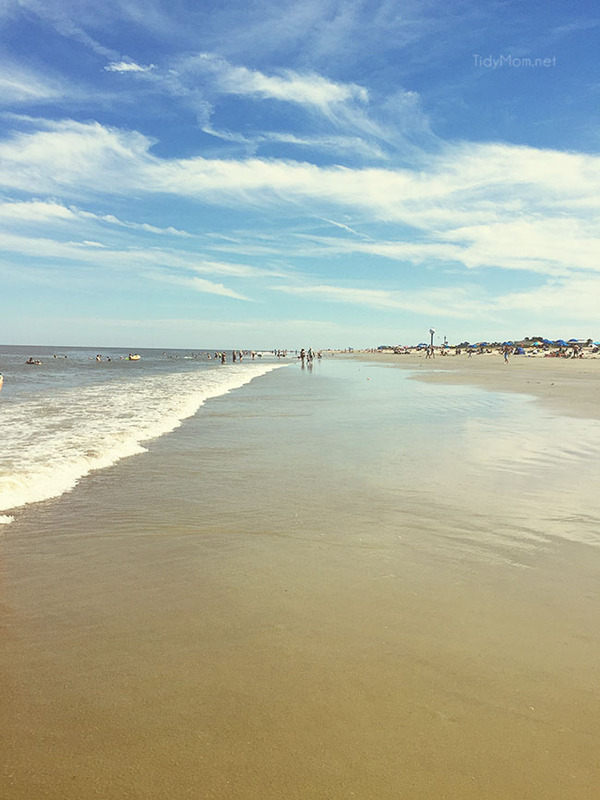 To say we loved Tybee Island would be an understatement. The beaches were decently busy but still had a sense of privacy. We hung out on the north end of the island, near the light house. At times we felt like we had our own little private beach which made for great photo ops with no awkward photobombs….score! 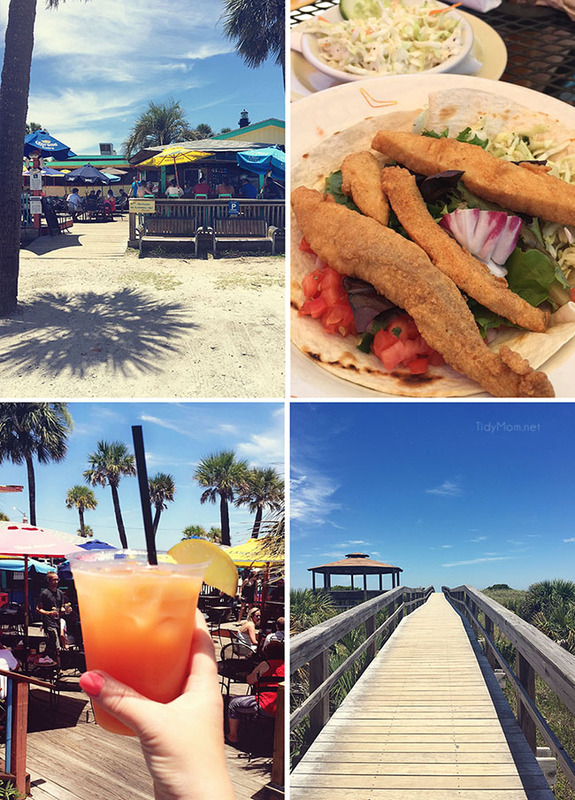 To add to the appeal of Tybee, there was a cute little lunch spot, North Beach Bar and Grill, within walking distance from the beach. We walked up to refuel with a Bahamma Mamma, and some fish tacos, then we were ready to go back and get our tans on. I highly recommend swapping regular fries with the sweet potato fries. They come with a sweet glaze on top and they were kind of amazing! After a day of sun and fun on the beach, we headed to The Crab Shack for dinner. It’s a popular, very low key (where the elite eat in their bare feet) spot known for its succulent seafood. 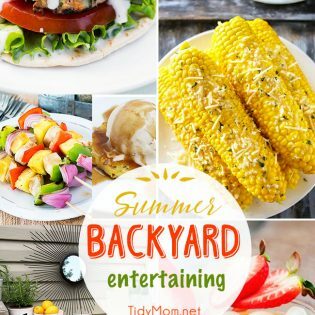 All dining is out side, although there is screened in “porch” like seating, which I don’t really recommend if it’s hot. The fans don’t help cool it off much and you’d be better off sitting outside (yes, I can speak from experience). BUT, I’ve also heard and read there are cats roaming all around the outside dining tables. There is a gator pond (you can feed the alligators) and a bird rescue room. So it’s a very unique place. I’m not sure if we were just exhausted from the heat and the beach, or if it’s because our visit started off with no one even acknowledging our table for the first 15 minutes (we were just about to leave when someone finally took our drink order and brought us water), but we just weren’t impressed. All the seafood is boiled (no fryer) only and the center of your table is a hole for a trashcan to catch all your shells and peelings as well as your styrofoam plates and napkins. The food was not great and overpriced. Shrimp is not deveined and was gritty. All three of us left hungry and crabby. We didn’t have time to eat any where else, because we had reservations for a sunset dolphin cruise. But we did find a great little ice cream shop called Seaside Sweets. 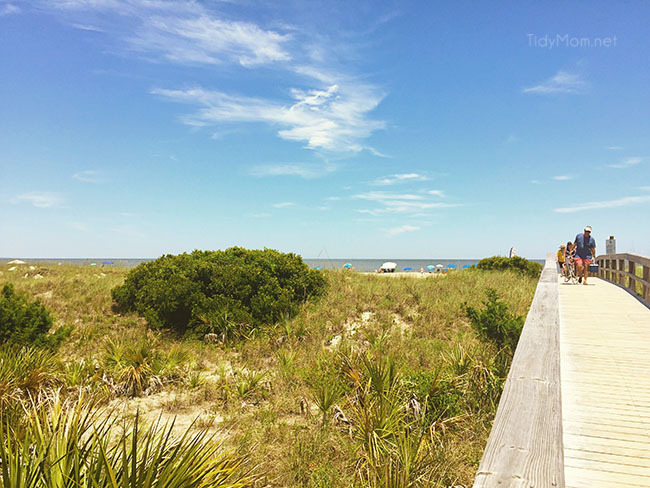 Oh, one important thing to note…… Tybee Island is a ” Pay-To-Park community“. There are no free parking spaces. There are parking kiosks that take cash or credit cards. You can pay for the whole day (or less) and move around, you just leave your paid receipt in your window. Clearly from the pictures above, we were having way too much fun on Tybee Island to leave after just lounging at the beach. 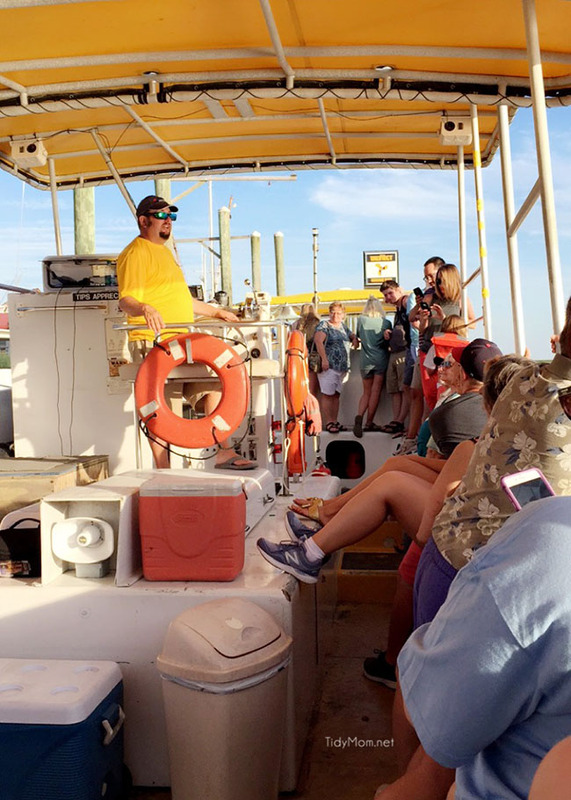 So we made the decision to go on the Captain Mike’s Sunset Dolphin Cruise. I know what you might be thinking, are those boat cruises really worth it? Do you really see any dolphins? Let me clear up those questions for you. The answer YES! We saw more dolphins than I could even count and it was so worth it! Even if you aren’t impressed by the dolphins, odds are you will be impressed by the sunset. 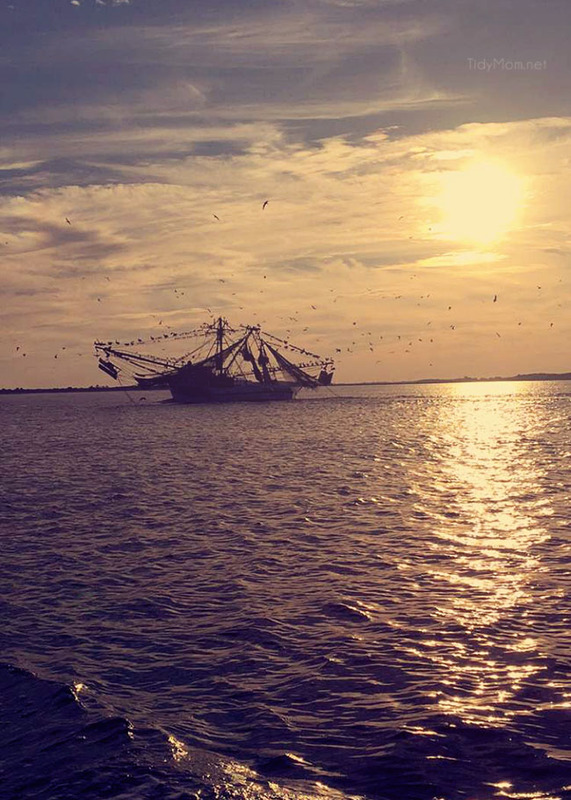 There’s just something about being on the water while watching a sunset that just makes it better. Plus we also learned some interesting history about the area while on the boat. Like this light house which is the oldest light house in Georgia. Another quick jaunt, just a 15minute drive from Savannah’s historic district, will get you to one of the most beautiful estates in all of Savannah – the Wormsloe Historic Site. A must see spot if you’re looking for beautiful scenery! The 1.5 mile bridge of mature oak trees and Spanish moss goes as far as the eye can see. A quick tip though would be to apply bug spray before arriving. While the trees make for great photos, they also attract a lot of bugs. It’s an absolutely beautiful and peaceful place. It’s quiet, idyllic, and definitely worth seeing! For a small fee, you can take a guided tour or adventure out on your own through the trails, which can extend up to 2.3 miles. We didn’t have bug spray, so we chose to just stay at the entrance to the 18th-century plantation that belonged to one of the original settlers of Savannah, and were still able to take in all this beauty. I know what you are thinking……a cemetery? Isn’t that borderline creepy and, well, boring? That’s what my daughters thought. Bonaventure Cemetery may not be Savannah’s oldest cemetery, but it is certainly its most famous and hauntingly beautiful. Bonaventure is a Southern Gothic sculpture garden on many travel lists as one of the most beautiful cemeteries in the world, and I have to agree……not that I’ve walked through that many cemeteries 😉 I probably took the most pictures at this 100-acre cemetery than I did any where else in Savannah. It was just so peaceful and beautiful, you almost forgot you were even in a cemetery. One last note. If you’re wanting to see the famous “Bird Girl” statue, which was featured on the cover of John Berendt’s book, Midnight in the Garden of Good and Evil, you’re not going to find it. The statue has been moved to the Telfair Museum of Art, due to concern of possible vandalism or theft. 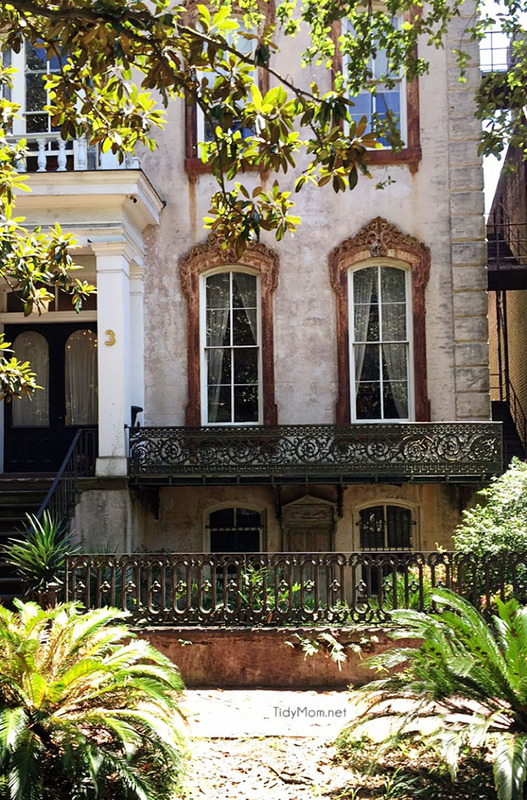 The Champagne Suite vacation rental in Historic Savannah, just a few blocks from the river. I would definitely like to make a trip back to Savannah in the future, maybe during cooler weather (mid June was hot and humid). There are so many more sights to see in Savannah that we didn’t get around to. Have you ever been to Savannah, GA? I’d love to hear what are your favorite sights to see in Savannah?! I love Savannah soooo much! 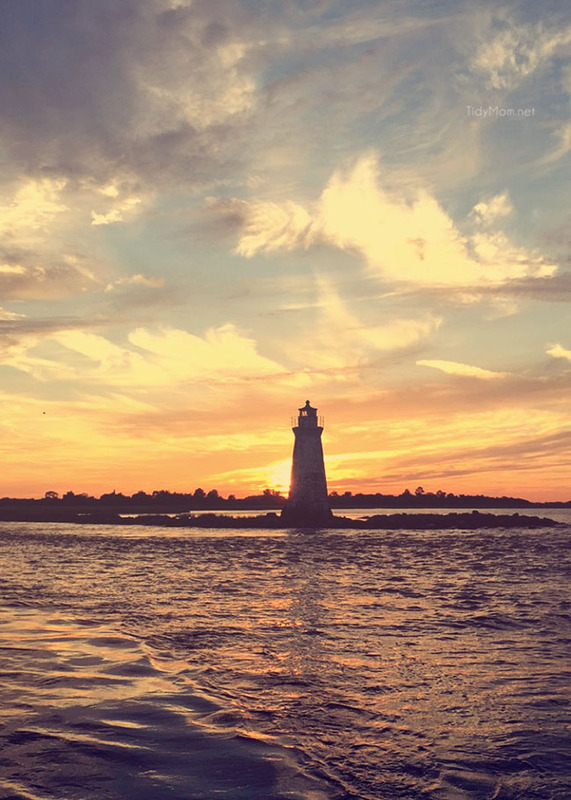 Your photos are beautiful, Cheryl! We love Savannah and have been there a lot, but not since 2012. One of the things we really liked was the “Foodie Tour”. Also did a tour bus that took us to most of the spots you talked about. You brought back some terrific memories! Thank you!! Who knew there was so much to see in Savannah? It’s definitely moved up my list now! I’d love to visit the cemetery! 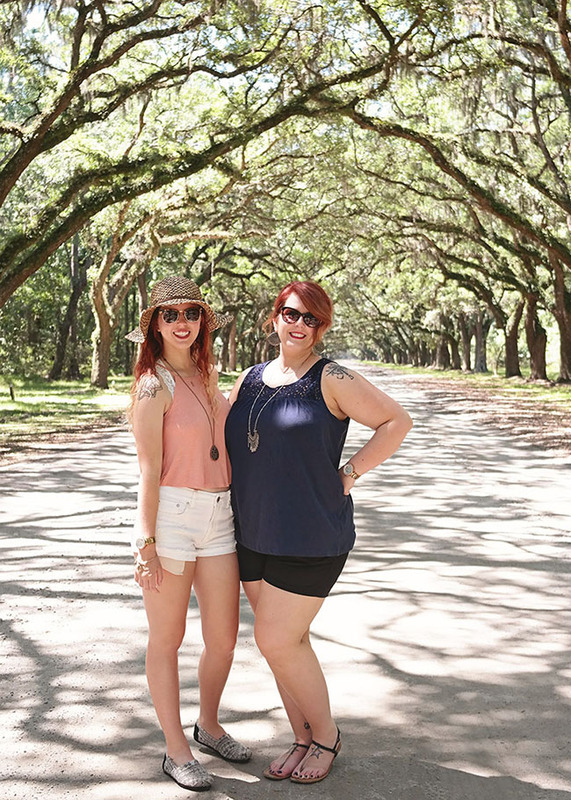 We have been to Wormsloe and those TREES were my favorite part of our trip to Georgia! GORGEOUS. This post is a million dollar post. Those photos. Just wow. Thanks so much Melissa! Wormsloe was gorgeous! 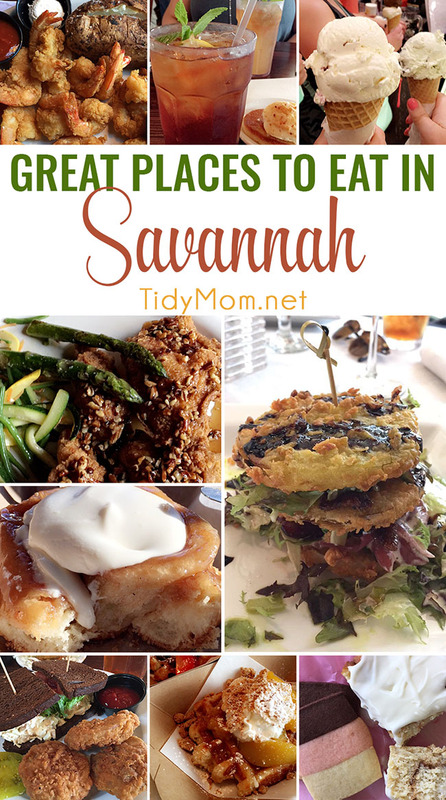 Loved your post on Savannah! You guys should go to Charleston next! Savannah’s sister city (PS. I plan on dying there! Lol). Pink Lady Restaurant is my fav! Thanks for a great party! I’ve been to Asheville and the Blue Ridge Mountains but I don’t think I’ve been to Charleston – we almost few into Charleston, because Southwest doesn’t fly to Savannah, but we ended up flying Delta. We’ll definitely have to put it on our list of places to go!! I love the Spanish Moss that is all around Savannah- so pretty! Next time, I need to take one of those Trolley Tours– they’re such a good way to see a lot of things you wouldn’t otherwise see! I have been dying to visit Savannah! I hear nothing but wonderful things. Your trip looked amazing! Savannah is on our short list of cities to visit—after reading this, I want to move it to the top of the list! So glad you enjoyed your stay here in Savannah! Isn’t it just so beautiful and inspiring? I’ve never really been to the South. I’m surprised how much parts look like you could be in Europe! As a native Savannah girl….Just one piece to think about…. the best time to visit is in April. The azaleas are blooming the days are usually in the high 70’s with nights in the cool 40’s. It can still be humid but it’s way more comfortable than any of the summer months. Come enjoy some southern hospitality and amazing food! See y’all soon! 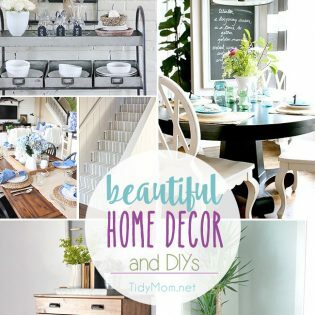 Beautiful pics, awesome post. Such a beautiful pace is Savannah. I’ve been to Savannah and absolutely loved it! Your post does a really great job of showing off the character of the place! Next month I’m headed to Georgia again (woo hoo! ), but this time I’m flying into Atlanta. I’m doubtful that the big city will have nearly as much charm as Savannah, but I’m sure it’ll be a great trip, too! My husband and I went to Savannah a couple years ago and we are heading back next year. I would love to move there as close to historic downtown as I could. I loved this post hoping to maybe go in November, as Sadie Robertson will be having a show in Atlanta. Fun fact about the Savannah Bee company: my name is Savannah Bree and my mom & grandmama had a kitchen store and went to a show and met the owner of the company. They told him my name and he now has a picture of me when I was little on his desk! ? These places are so Instagrammable and awesomeness! Dying wanna visit them!